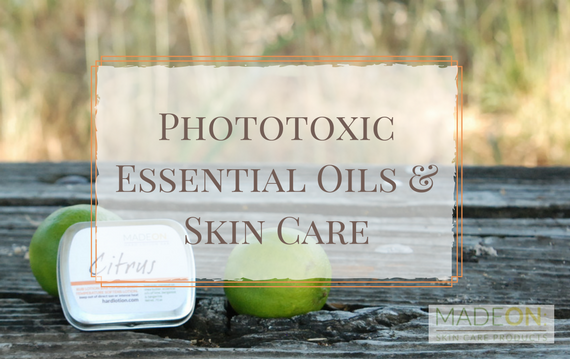 Citrus Essential Oils: Are they all phototoxic? Are you one of those “gotta have lemon or lime in your water” kind of people? I am, especially in my sparkling water (or what our family affectionally calls “fizzy water”). So, I was excited to find that my love for citrus was shared by the many customers who told me that if we were to add a scent to our lotion bars, any combination of grapefruit, lemon, lime, etc., would be well-received and loved. I love this combination. It’s a wonderful scent for the skin, with a bit of pick-me-up added. Along with the scent blend, we did our due diligence to make sure that our choices were also non-phototoxic. What does that mean? Phototosensitivity is an adverse skin reaction to some essential oils and other treatments, in which the skin reacts to ultraviolet rays resulting in redness, hyperpigmentation, and in severe cases, blistering. (source). Many known phototoxic oils include citrus, however, not all citrus oils are phototoxic. Our citrus blend is safe. Photosensitization is a reaction to a substance applied to the skin that occurs only in the presence of UV light in the UVA range. Therefore, if you have applied phototoxic eo’s to your skin, stay out of UV light for 12-18 hours. Not all citrus essential oils are phototoxic. Many steam-distilled versions are safe to use. The essential oils used in our citrus lotion bar are sun and skin-safe. If you do use potentially phototoxic essential oils, make sure they’re properly diluted. By the way, this is a seasonal product that won’t be in stock forever. For now we are well-stocked, but once we run out of the essential oils, we’ll stop production. Get ’em while you can!